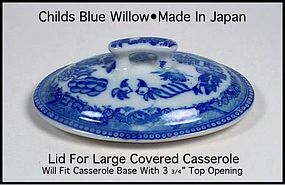 This child's Blue Willow lid to the oval casserole is for the larger size set. The size is on the photo. 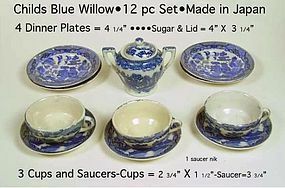 This child's Blue Willow 12 pc set of extras is for the larger size set. The sizes are on the photo. Marked Made In Japan on the back. 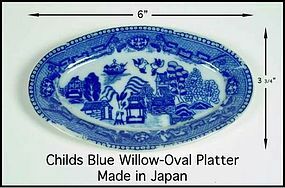 This child's Blue Willow oval platter is for the larger size set. The size is on the photo. Marked Made In Japan on the back.